An unhealthy workforce significantly hurts the UK’s economy and society due to lost productivity, reduction in income tax receipts, increases in long-term sickness and increased healthcare costs, according to research by The Work Foundation. The costs to the taxpayer – benefit costs, additional health costs and forgone taxes – are estimated to be over £60bn. 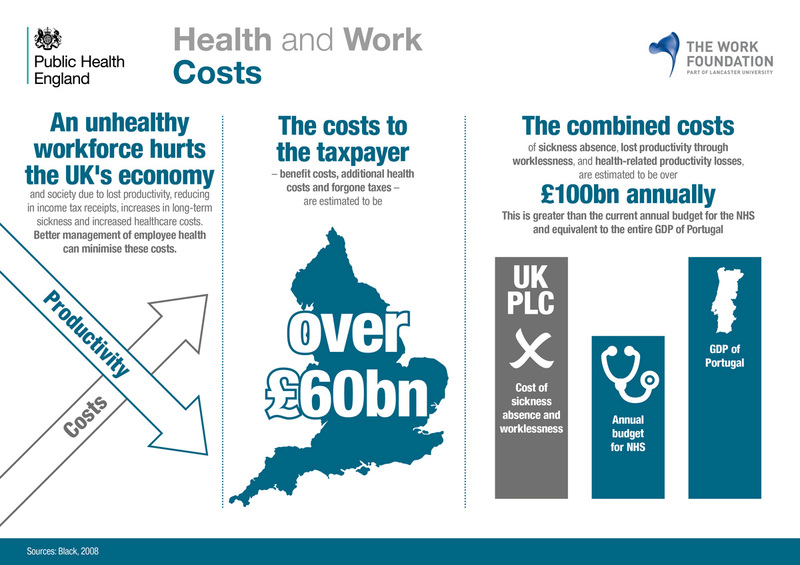 And the combined costs of sickness absence, lost productivity through worklessness, and health-related productivity losses, are estimated to be over £100bn annually. This is greater than the current annual budget for the NHS. As an example of effective health and safety management, the HSE cites Sainsbury’s, for which an external health and safety audit identified a need to develop a unified approach, and also recommended more direction from the board, to develop an effective strategy. training on health and safety responsibilities was introduced for all board directors. raising the profile of health and safety so it is becoming embedded in the culture of the organisation.